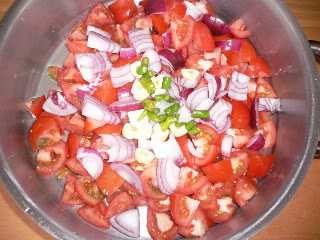 Wash the tomatoes and dice into 2 or 3 cm pieces. Peel and chop the onion and dice into 1 cm pieces. 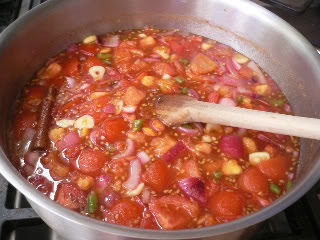 Place the vegetables in a large saucepan with the chillies, garlic cloves and ginger. 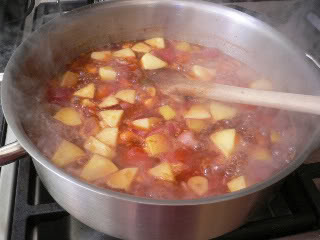 Bring to simmer, stirring often, and when the tomatoes are starting to break add the sultanas, vinegar, salt, hot chilli powder (if using), cinnamon and cloves. Bring back to simmer point and then add the sugar. Stir well until the sugar is dissolved, then add the apple, also diced into 2 or 3 cm pieces, but not peeled (apple peel contain pectin, a setting agent). Keep stirring and simmer until the apple becomes soft, but not mushy. 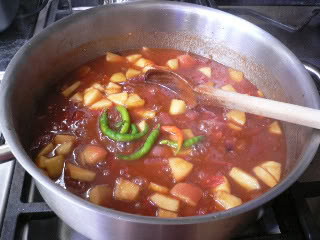 Add some fresh chillies if you like and simmer for five more minutes. 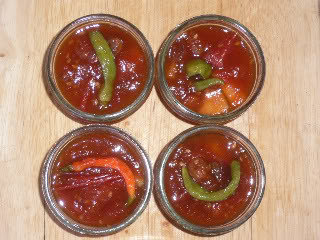 Place the hot chutney into sterilised jars (dried in the oven), then let it cool down and close with the capsule lids. Place the jars in a pot and cover with water. Bring to the boil and simmer for 20 to 30 minutes, depending on the size of the jars. Let the jars cool down in the pot overnight and when they are cold make sure that the capsule has popped by pressing gently on the lid. Store in a dark place and then, once opened, in the fridge. that looks fantastic, Alessandra. our tomatoes are still growing and yes, I am going to make tomato chutney as well... gosh, there is always a way to use up homegrowns, isn't there? @ Mary, yes great with cheese, I like it with aged cheese the best.